Some great rustic basement ideas can create a fun feel for your basement and a place you really want to spend time after a long day. If you’re like a lot of people, your basement is your hideaway. It’s the place you go to relax and unwind or have time with your family or friends. Maybe you like to go downstairs with your friends and play darts or pool. Or maybe you’d rather go down and watch the game. No matter what you plan to do, the ideal rustic basement ideas can make a big difference in how much you enjoy your basement. If you’re not sure just what you’re going to do in that basement you should start your planning there. 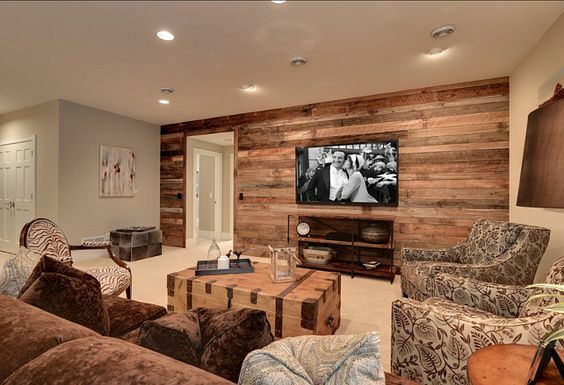 Do you want to go all out with the basement and get a cabin feel or an outdoorsy feel? Maybe you just want a few things that help you relax. It’s entirely up to you how much (or how little) you decide to put into that basement. The best thing to do is look at the options that are out there and the things you’ll want to do in your basement. If you’re using it as a bar and game room you could create your own speakeasy (and how fun is that?). 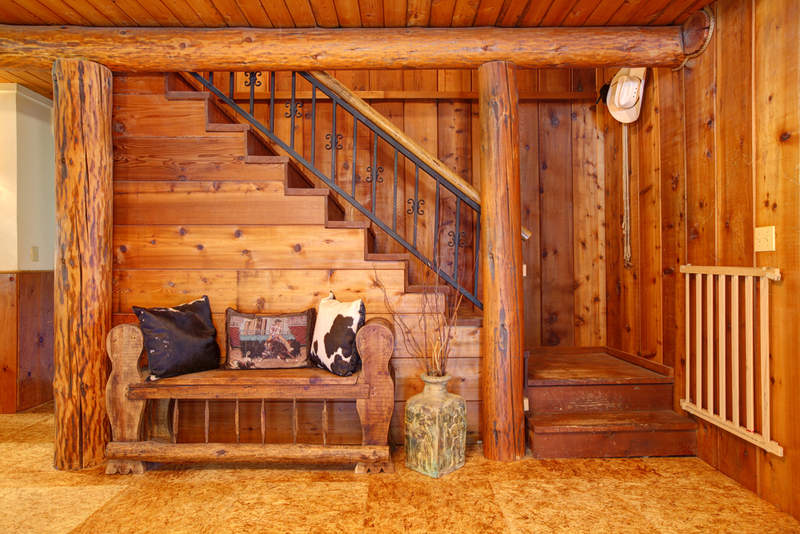 If you want to use it as a playroom for the kids an old-style barn feel can be a lot of fun. Think about what you’re really planning to do with the room when it’s done as your starting point and build from there. The great thing about this is that you’re in charge of the cost. If you want to put a few cool lamps and some panel board in you’ll be spending a few hundred dollars or less. 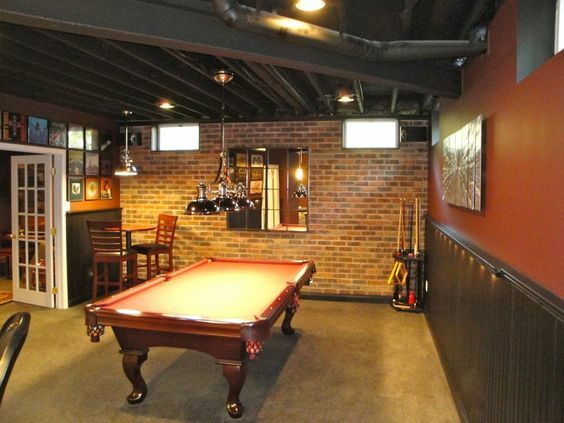 If you want to go all out and change your basement into a true speakeasy you could spend a few thousand dollars or more. The key is figuring out what you want. The cost is entirely up to you and your plans. You may even be able to save some money on more extensive remodeling and decorating if you’re careful about it and pay attention to discounts or who can help you. Maybe you want to put everything in all at once or maybe you want to work on it over a period of time. All of these things can help you save money or cut down costs at least a little bit. 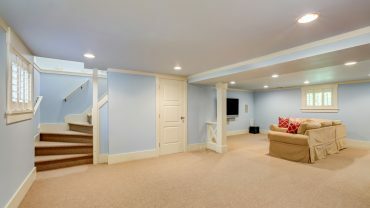 If you don’t know what to do about your basement check out some of these options. 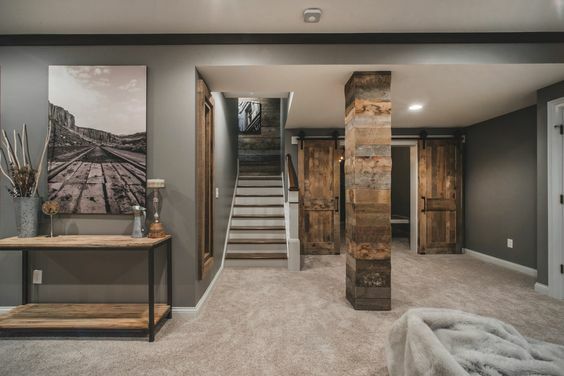 We’ve found a number of rustic basement ideas that could help you figure out just what you’re looking for, and what you’re going to want. There’s some with a few basics and some with a really elaborate look. Whether you want to go all-in or you want to take it a little easier, you’ll find something. So take a look at what we’ve got planned and see which options you like best. And of course, don’t be afraid to tweak some of these options to fit your idea of a perfect basement getaway. The wood paneling on the back wall along with the wood chest console table definitely give a rustic feel. Even the table and the TV stand seem to add to the look but without a whole lot of time or money needed. Here we’ve got a little bit of wood accent pieces on the walls and in the furniture, but it’s really the wrap on the support beam and the barn doors that seal the deal. It definitely looks rustic but without a whole lot to make it over the top. The tan color on the walls and the wood style furniture really help accent this room. Of course, it’s the frame around the doorway that really kicks this up a notch. 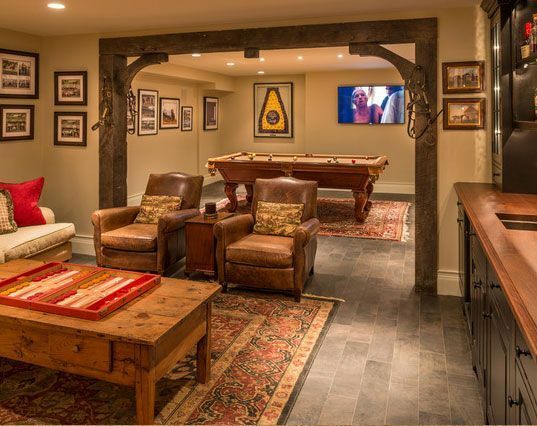 The brick walls on this basement really make it look more rustic and the small wood bar on the side and wood surround on the pool table make it just the right mix. Plus the wood floor improves the whole look. If you’re looking to go all out this is a great speakeasy idea for your basement. 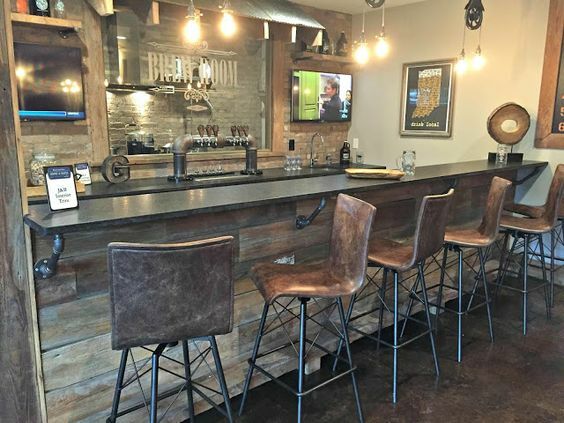 With plenty of wood accents and an old fashioned saloon vibe, you definitely get a lot out of it. 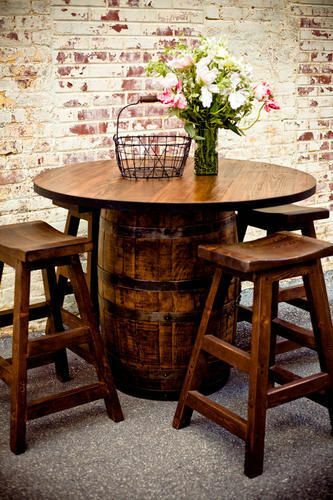 If you just want a little bit of something to make your basement feel more rustic you can get one of these wine barrel tables. With the brick background walls it really does give you rustic at a lower cost. 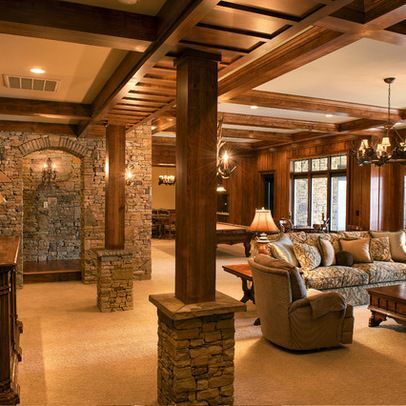 Here’s a slightly different bar style for your basement with stone support beams and wood walls. 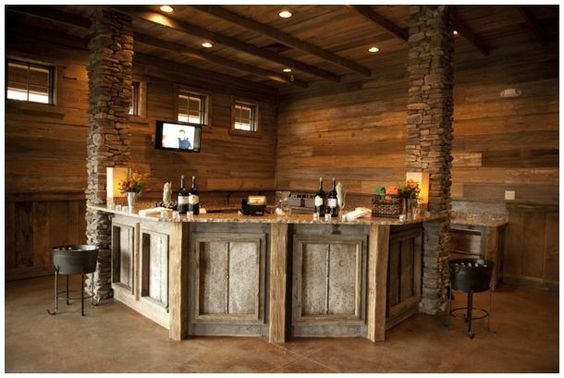 Of course, it has a great looking rustic bar to go along with it too. How’s this for rustic basement ideas? 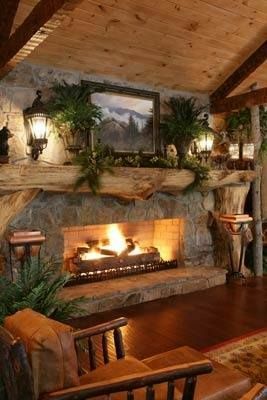 You get a cabin style basement complete with fireplace and rustic wood furniture to go along with it. 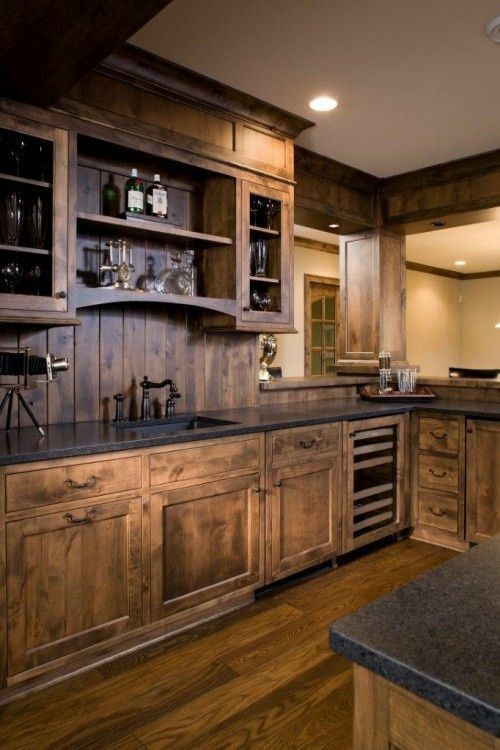 Here you’ve got a little more elaborate looking bar that really gives you plenty of space to entertain. Plus everything is wood and more rustic than you might think. When we skip the bar and go with a living and game room you can go with wood beams and brickwork alongside your more rustic accents. This one is actually quite large and with a walkout to enjoy the outdoors too. 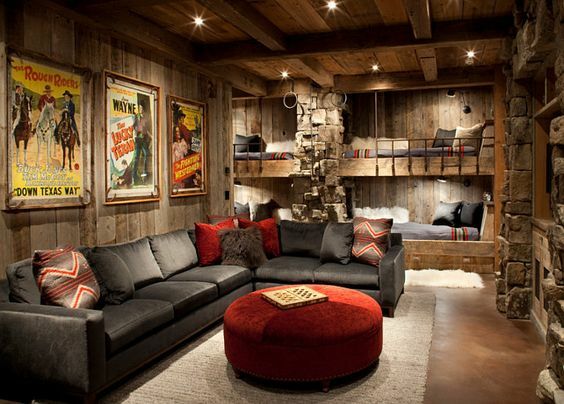 This is definitely a rustic style game room with wood ceiling and floors as well as wood accents and old style games. You’ll love playing anything here and bringing all your friends over too. 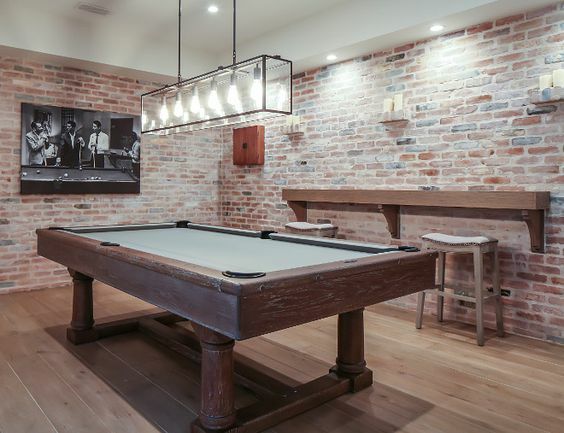 This is a little more simplistic style for your rustic basement ideas because it just has a simple wainscoting and brick wall alongside older style games. It’s definitely something you can save a little on but still enjoy. Brick walls and wood ceilings work really well together and the wood accents and darker colors help it even more. 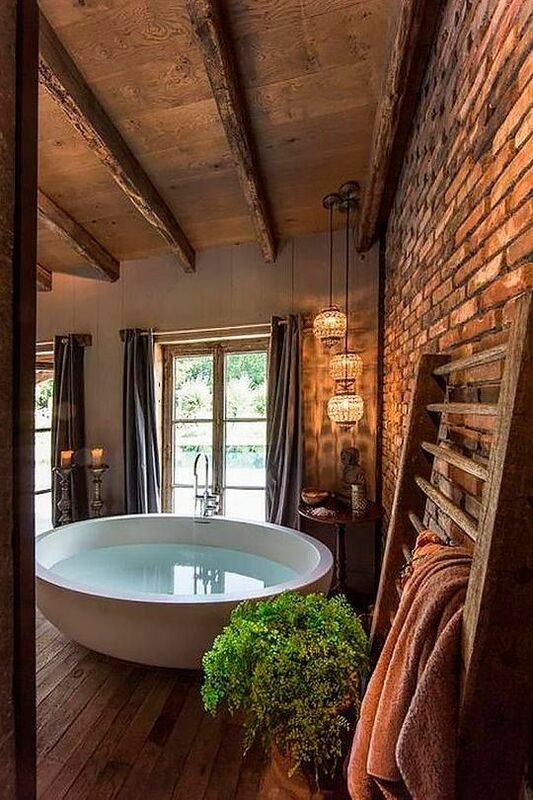 You end up with a rustic and relaxing place (including a tub to help relax even more). Here you’re going all out but for a bunkhouse and place to relax. The wood panels and the brick accents really do help get things going, but you’ll be putting more work in here.